A high-performance material for wear applications in extreme cold weather. Redco™ 600 is able to hold its form under load and stress in structural applications. 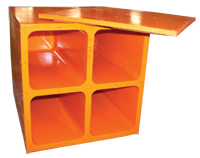 A strong choice where mechanical properties are required to be coupled with urethane’s exceptional impact, wear and abrasion resistance. Forklift tires, dolly wheel tires, washers, wear slides, high impact/low temperature parts, slide pads, svi pads, wheels, etc.